Do you use lists? Why or why not? How do you currently use lists? Why do you put caches on lists? Are there list related tasks that are tough to do? Yes I use lists, the most important one for me is the watchlist to follow the activity on the caches I placed with other geocachers but I don't own (to know when a maintenance is required, etc.). I also like to read the comments on great geocaches I have found. Do you think it could be possible to add small icons that we could chose for all the caches present in a list (I mean one icon per list), and then use this icon on the map? 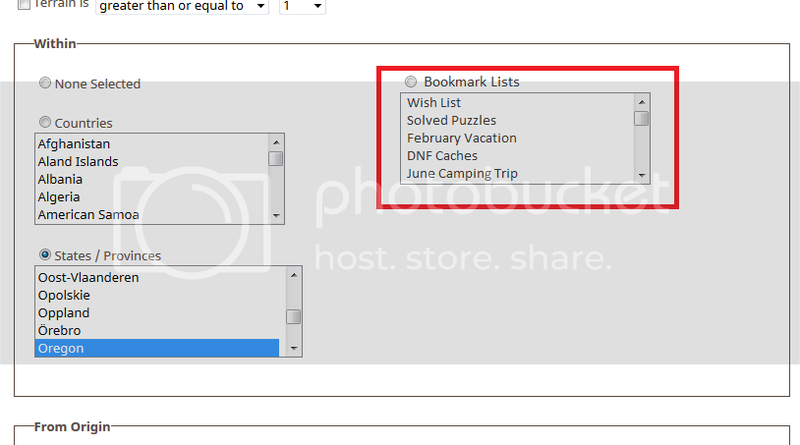 For example all the caches near remarkable trees (in a bookmark list) could be shown with , with an activation option on the map to display this icon or the usual one (type of the cache)? Do you use lists? Why or why not? How do you currently use lists? Why do you put caches on lists? Are there list related tasks that are tough to do? And, while not entirely list related, I can't use dates in Searches. One should, at a minimum, be able to use Date Placed and Last Found as Search terms, with the ability to specify exact dates, before a date, after a date, or within a range of dates. Do you use lists? Why or why not? Yes. They give me a way to group caches in ways that may not be easily categorized by other methods such as a simple search. Lists are also practically required for some challenge caches. How do you currently use lists? Why do you put caches on lists? Are there list related tasks that are tough to do? Besides the Favorites list and the Watchlist, I do also use an Ignore list. I have two lists of puzzles I have solved but not yet found. I have several lists documenting my fulfillment of requirements for challenge caches. In one case, I have met the requirements but not looked for the physical cache yet. I have a list of caches for a group outing. And I have a list of caches in a county park system that charges non-residents an entrance fee. I would like to be able to search for other people's public bookmark lists. I would like to be able to edit an entry at the time I add it, rather than it going directly onto the list and having then to locate it and edit it. The name of a bookmark automatically defaults to the cache name when you create a bookmark. Have you ever changed the name of a bookmark in one of your lists? Why did you feel the need to give it a name other than the cache name? How frequently do you change the names of bookmarks? Please list out the reasons you would change the name of bookmarks. Please see the picture below for reference. Heck, yeah, I change the name. For the county park system where I'd have to pay to search, which park is it in? Similarly for challenge caches, which county is it in, or on what date was it placed? For challenge cache bookmarks, sometimes to float the challenge cache itself to the top of the list. I change the names of caches on about a third of my lists. In creating a bookmark, how do you use 'comments' differently or the same as the 'bookmark name'? I don't understand the question. I do use the comments sometimes. I use it to say why the cache is on this list, or how it meets the requirements of a challenge. Or do you mean the description of the entire list? Yes, I find them quite useful at times. I use lists to keep track of FTF, Ignored caches, Watched caches (watchlist), caches for trips to other areas, and one for interesting puzzles. The listing task I would like is to be able to create a list from a PQ, a reverse of the currently available feature. When you use the term "Bookmark(s)", are you referring to a cache on a list, or the actual list? I find the terminology a bit confusing. Changing the cache names to achieve a certain order (alpha-numeric) when they are added to a Bookmark list is something I have done quite often. 1. Do you use lists? Why or why not? Yes - I use the list features extensively. Lists are an essential part of my geocaching activities. 2. How do you currently use lists? Why do you put caches on lists? Are there list related tasks that are tough to do? Ignore List - I haven't used it. To watch caches I've DNF'd, so I will be alerted if there is a find or owner confirmation. I only watch DNF'd caches that are relatively close to my geographic area. To watch some of the lonely caches I've found. It's interesting to see if it takes a long time for them to be found again. To watch TB's that are of specific interest to me. Lists of DNF's, FTF's, and Lonely Caches that I've found. A Wish List of interesting caches I've heard/read about. Most are in places I'm unlikely to visit, but putting them on this list makes it easy to find these cache listings later. A list of mystery caches that either (1) have solved coordinates or (2) are completed challenges. I run a PQ of this list periodically and load them onto my GPSr. I exclude Mystery caches from my other PQ's. When I see a question mark on my GPSr, then I know I can attempt a find at that location. I go through this list occasionally and delete caches that I've found. A list of Challenge caches where I've completed the requirements. A list of Challenge caches that I might qualify for someday, or that are merely interesting. I'll go through this list periodically to see if I'm close to fulfilling the requirements. Once I've fulfilled the requirements, then I delete the cache from this list and add the cache to lists #3 & #4 above. Lists that allow me to group caches in specific ways (ie, caches hidden indoors, caches hidden in fake birdhouses, etc). I have a couple lists to track Challenge cache requirements, but most of the challenges I'm interested in are tracked within a spreadsheet that includes all of my finds (which I download via GAPP). Having a "Move" option to move a cache from one list to another list would be great, especially if it retains the information within the 'comments'. Having a "Copy" option to copy a cache from one list into another list would be nice, especially if it retains the information within the 'comments'. When viewing all Lists, the 2nd column only shows either "Shared" or "Not Shared". It's not possible to identify which "Shared" lists are also "Public". The 2nd column should show values of Public, Shared, or Not Shared. Include clear explanation of the distinction between Shared vs Public lists. From what I've seen, a list marked as "Public" must also be marked as "Shared" in order for others to see it. If a list is marked as "Public", but not "Shared", then it's essentially the same as a Private list. Bookmark lists would be included on an individual cache page only if the list is "Public". Change 'Bulk Delete' button to read 'Delete Selected'. Being able to view a List on the map, similar to how PQ's can be viewed on the map at Play --> View Geocache Map. without all the extra clicks of creating PQ's for each list. Include more columns when viewing a List. Distance, Found/Unfound, Cache Type, GC Code, and Cache Name are essential. It would be great to also see the other fields that are included in search results: D/T, Size, Placed Date, Last Found Date, Cache Owner. When viewing the "Lists" tab of a cacher's public profile, it would be great to select whether their Favorites or Bookmark lists are displayed. Perhaps by having buttons within the "Lists" tab, similar to how there are Basic/Maps/Milestones buttons within the "Statistics" tab. Change the "Bulk Delete" button to read "Delete Selected Caches". The only time I've changed the cache name is when I wanted the caches in the list to be ordered a specific way. This list was for proving qualifications for my first challenge cache find. In general, I'd prefer not to alter the cache name. To note the date I found the caches in my FTF list. To note the previous find date and my find date in my Lonely Caches list. To note the cache's general location (city, state, country) if they are far away from home. To summarize the requirements of a challenge cache, so I can scroll through my 'possible challenges' list without having to open each cache individually. I do use lists, mainly to keep track of caches I need to get for challenges or caches I have found but have not yet logged. I use offline saved lists in the paid app so that I always have access to a list of caches I need to complete challenges. I also use saved offline lists to save the caches I have found while out caching and then I reference that list later so I can log the caches. I also use it to keep track of caches I have DNF'd that I plan to go back to. I would like lists generated on the site to be automatically available in the app. Perhaps have a check box on the bookmark page to download it to your offline lists on your phone. Or just make it available like PQs are and if we want to save them to our offline lists there is a option within the app to save them all to the offline list. Also, it's not easy to navigate around while you are building a bookmark list. Some sort of navigation tool to make it easier to build lists and manage them would be nice. I always change the name of the bookmark because its usually a list I am generating for a challenge I have either completed or am working on. So the name of the bookmark always describes whatever the list is for, not any one cache in the list - that's just not helpful at all. I normally don't use the comments, unless I am sharing the list with others or if I need to make note of some sort of qualification for a challenge cache and I need to make multiple lists for the same challenge, for example, the 360 degree challenge, I might have the degree in the name of the bookmark and that it's for the 360 Degree challenge in the comments. It's nice to have, but I don't use it a lot. Many cache owners have come to the forums to ask if it's possible to know who is watching their cache. Most often the reason they want to know is they suspect something nefarious is going on. My suggestion: Remove the number beside Watch. It's not useful and may cause anxiety. Thanks so much for the thoughtful feedback, everyone! We really appreciate hearing how you use lists. Closing the thread to compile all your thoughts now.